Wildcard DNS Record means using ‘ * ’ to match all subdomains. The number of subdomains many more than above, but the corresponding IP is only one. Now you need Wildcard DNS Record to help you simplify this. Mixed Wildcard DNS Record is adding a limitation based on the Wildcard DNS Record, classifying records as demands. Like the following are some subdomains needed to be edited. 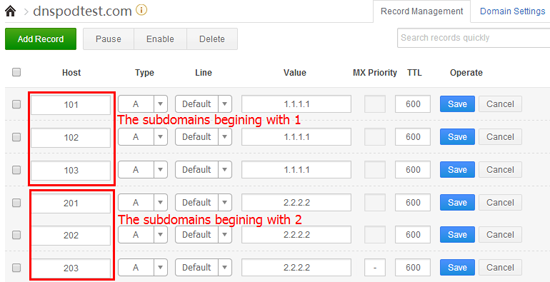 Subdomains can be grouped as such limitation, and each group will only have one corresponding IP. Now Mixed Wildcard DNS Record can help you simplify those records.